Combine the flour blend, 250 grams sugar, baking powder and 4 grams salt in a large mixing bowl and form a well in the center. In a separate bowl, whisk together all wet ingredients except for the egg whites. Slowly whisk the wet ingredients into the dry ingredients, making sure no lumps form. Scrape down the sides of the bowl with a rubber spatula. Place the egg whites and remaining pinch of salt into the bowl of an electric mixer fitted with a whisk attachment. Whip on high speed until the whites become opaque and frothy. Reduce to low speed and gradually add remaining 50 grams of sugar in a slow, steady stream. Increase to high speed and whip until the meringue mixture has reached medium peaks. In three additions, gently fold the meringue into the cake batter. Avoid overmixing or the batter will deflate. Spread the batter onto an 18-by-13 sheet pan greased and lined with parchment or wax paper. Bake about 15 minutes. A toothpick inserted at the center should come out clean. Run a paring knife along the edges to loosen the cake. Sprinkle powdered sugar on top followed by a clean dish towel to prevent sticking. Flip the cake over, remove the parchment or wax paper and sprinkle again with powdered sugar. Working quickly while the cake is still warm, roll it up into the towel. Cool. Unroll the chiffon cake on a clean, flat surface so the short side is parallel with the counter. Spread frosting over the surface but leave room around the borders for the icing to spread, reserving enough to cover the outside log later. Using the towel to assist you, tightly roll up the log. Place onto a serving platter with the seam side down. Spread a 1⁄4 -inch-thick layer of frosting all around the log and make a small diagonal cut at one end of the log to expose the interior of the cake. Refrigerate for up to two days. 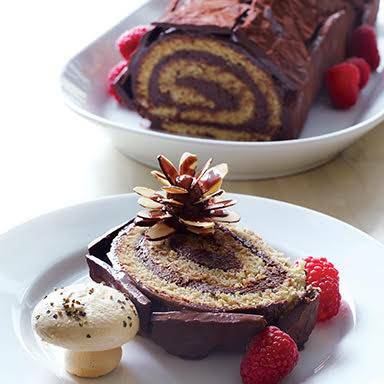 To assemble the yule log, place pieces of the chocolate bark in a lengthwise fashion covering the chocolate icing. Lightly dust the meringue mushrooms with cocoa powder and place around the log. Do the same with the chocolate-almond pine cones. Makes 12 servings. To make the infused chocolate bark: Heat 175 grams canna coconut oil* with 5 grams vanilla extract and 2 grams salt until mixture is hot to the touch. Pour it over 250 grams chopped dark chocolate and allow it to sit for 2 minutes. Whisk thoroughly to combine. Crumple a piece of parchment or wax paper lengthwise, unfurl and lay it on a sheet. Slowly pour the infused chocolate over the paper, allowing it to settle into the grooves. Refrigerate to set, about 30 minutes. Carefully peel the paper away from the chocolate and break into long, rectangular pieces. 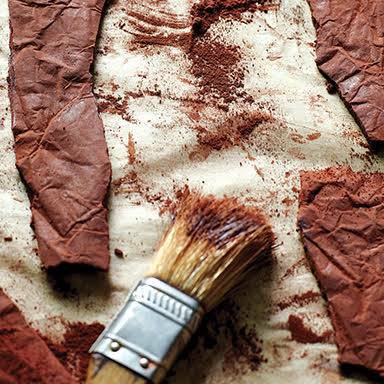 Brush with cocoa powder to accentuate the grooves and crevices. To make meringue mushrooms, whisk together 90 grams egg whites, 2 grams salt and 1⁄4 teaspoon lemon juice until soft peaks almost form, and slowly add 180 grams super fine sugar. Turn mixer on high and whisk into firm peaks. Gently fold in coarsely ground black pepper. Place meringue into a piping bag fitted with a straight tip about 1/3 inch wide. To pipe mushroom caps, hold the piping bag at a 90-degree angle and squeeze the bag to form a 2 inch round disk that’s about 1 inch high. Make 12 caps. Pipe 18 stems (in case some break) envisioning the shape of an inverted cone, with the wider part as the base and the thinner part at the top. Make extra caps and stems with leftover meringue. Place the tray into a preheated 200 F oven for about 4 hours. Cool and store in an airtight container. To make the chocolate-almond pine cones: Divide 395 grams almond paste into 12 equal pieces and form into a cone shape, about 11⁄2 inches tall and 1 inch in diameter. Insert sliced almonds (225 grams) with the pointed end into the almond base to resemble a pine cone. Place pine cones onto a parchment- lined sheet tray fitted with a wire rack. Melt 454 grams of the chocolate mixture and spoon over the pine cones to coat them evenly all around. Refrigerate. To make a gluten-free whole grain flour blend: Combine 119 grams oat flour, 119 grams sorghum flour, 47 grams sweet rice flour, 19 grams tapioca starch and 11 grams flax meal. Makes 315 grams. To make chocolate cream cheese frosting: Whisk together 225 grams confectioner’s sugar, 56 grams cocoa powder and 1 gram salt in a large bowl. Add 450 grams softened cream cheese and beat until smooth. Add 110 grams softened butter and 7 grams vanilla extract. Whisk in 113 grams melted bittersweet chocolate and beat until light and fluffy. Store in an airtight container for up to two days at room temperature or for four days in the refrigerator. Recipes courtesy of James Distefano, an executive pastry chef and culinary instructor in New York City.